This recipe is a version of a previously posted recipe for green beans with pesto This one uses primarily cauliflower. One other difference is that I used pine nuts which does make pesto extra special. The gluten-free bread shown here was delicious freshly baked and served hot with these veggies. It is easy to make–stay tuned as I will post that recipe next time. Prepare the pesto but double the recipe, and set aside. Steam the cauliflower in a vegetable steamer until just tender–this means you can pierce the florets with a fork with just a little resistance. Remove from heat and rinse with cool water to stop the cooking, drain, and place in a bowl. Now steam the green beans to the same tenderness following the same procedure and then adding to the cauliflower in the bowl. Now use a spoon and mix the vegetables together well. Add the pesto mix and stir well again. Add the olive oil and mix well again. Taste and add more salt if desired. Serve room temperature or keep in refrigerator to serve cold as it will keep for a few days. Turnips are the round tap roots of the turnip plant. Folks from the South may be familiar with turnip greens but the root is good also. If you’ve never seen them in the produce section, they’re about the size and shape of beets but they are white with a purplish blush around the top. Give this low-glycemic vegetable a try–it’s a nutrient-dense Brassica without the characteristic strong taste of this family of vegetables. Slice off the top end of the turnip and carrot and scrub them very well before chopping–no need to peel as long as you can remove all the dirt with a vegetable brush. Melt oil in large skillet over medium heat. Add onion and stir for a few minutes. Add the spices and stir again. Add the carrots and turnips and stir well continuing to cook over medium heat. Cover but give a stir to prevent sticking every few minutes. Check for tenderness after 10 minutes and cook until tender–carrot and turnip pieces should be easily pierced by a fork. Serve immediately. Dairy-free whipped cream? Yes, this really works. Just be sure your can of classic organic coconut milk (only the full fat version) is very cold by refrigerating it overnight. Then once you open the can, be sure to scoop out only the white solid part (not the liquid in the bottom of the can) that has set up in the upper half of the can. The liquid in the bottom can be saved and used for smoothies. Keep the white solid part cold until you are ready to “whip”. Also, chill the bowl you will be using to whip the “cream”. Scoop out the solid white coconut in the top of the can (as described above) and place in a bowl that has been chilled in the refrigerator. Whip with an electric beater. When beautifully creamy, add the honey and vanilla. Beat again until well mixed. Serve immediately or chill until served. Wholesome ingredients make the best desserts. These chocolate pieces are yummy alone or as topping on berries served with coconut whipped cream. Other nuts can be substituted for the macadamia nuts. Also, this mix would work as a chocolate layer on peanut butter or almond butter squares or fat bombs. Desserts do not have to be high in starch or sugar–I prefer them being higher in good quality fats. Here’s a good example of that principle. Spread the chopped nuts in the bottom of a 8X12-inch shallow baking tray or dish. Set aside. Melt first three ingredients in a double boiler–only warm enough so that it melts. Mix well Take off heat. Stir in the honey, cacao powder, vanilla, and salt. Beat until thoroughly mixed and smooth; pour over the nuts. Refrigerate until hardened–at least 2 hours. Cut into 2-inch squares. Remove with spatula and serve cold. When the summer heat hits, vegetables served cold are a good way to go. Cultured or fermented vegetables are very popular now but don’t forget about marinating the more fibrous veggies too–cauliflower and broccoli are perfect for marinating. By partially cooking them before marinating them they are easier to digest but will still be crisp. Other ingredient options are olives, grated carrots, chopped sweet red pepper, minced parsley, scallions, etc. I hope you have fresh herbs from your backyard or patio–fresh is best! This mix of vegetables can be served over mixed salad greens or in place of steamed vegetables on your “perfect plate”. 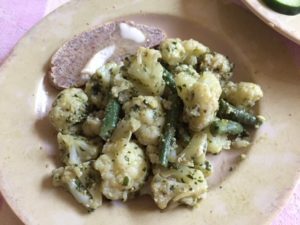 Place the cauliflower florets in a vegetable steamer with the lid on and steam over boiling water for about 5 minutes–watch closely, stirring a few times, and pierce with a fork each time you stir. As soon as you can pierce a floret, remove steamer from heat and rinse the cauliflower with cold water briefly. Do not overcook! Place them in a bowl. Add dressing and other vegetables. Stir well until vegetables are coated with the dressing. Refrigerate until well-chilled for at least 2 hours. Serve cold. Grain and gluten-free, these squares made with mainly onion and dry shredded coconut are best served warm right out of the oven. The caraway seed is optional. I have served them with salad or soup instead of crackers. They are also delicious with a cheese spread made by blending together 1/4 cup feta cheese (I use sheep’s milk) and 2 Tbsp. mayonnaise and some fresh, minced chives if you have them. Melt ghee in skillet. Saute chopped onion for about 5 minutes over medium heat stirring a few times. Remove from heat. Place all other ingredients into a food processor. Add the sauteed onions. Process until thoroughly mixed. Place the mixture into an oiled medium-sized baking pan. Rub 1 tsp. olive oil into the palms of your hands and press the “dough” evenly so that it is about 1/4-inch thick. Bake at 300 degrees F until lightly browned and dry to the touch. Baking time will depend on the size of your pan and how thick you spread the mixture–expect about 30 minutes. Remove from oven and cut into 2-inch squares. If you want more of a cracker rather than a moist flatbread, return the pan to the oven and let them bake longer at about 250 degrees F. Monitor closely so that they don’t over-bake. Serve warm, or refrigerate for later and warm again before serving. This mild, creamy dressing works well with stronger tasting salad greens such as escarole, endive, radicchio, and arugula. It’s easy to make with a blender. If you like garlic, 1 clove of garlic is optional. Makes about 1 cup of dressing. Place all ingredients in a blender container and blend until smooth. Add a Tbsp or two of water if thinning desired. Great snack mix for carrying or travelling. It provides fats to satiate and to get you burning fats but also is a good source of fiber– plus there are few if any calories from carbs. Experiment with different types of balsamic vinegars to vary the flavor. Melt ghee on low heat–don’t get it hot, just warm enough to melt–and place in large bowl (or melt the ghee in a large metal bowl). Add balsamic vinegar and mix well. Add the coconut chips and toss until all the coconut chips are coated with the ghee/balsamic mix. Sprinkle the sesame seeds and 1/2 tsp. salt over the coconut and mix well. Taste and add more salt gradually to taste if desired. Spread evenly in a large baking pan. Place in oven on lowest setting (my oven has a drying convection option at 140 F) and leave until thoroughly dry (3-6 hours) If your lowest oven temperature is higher, be very careful to watch for overbaking–drying time may vary widely depending on oven temp. You are not trying to toast or even lightly brown this snack mix–just want to dry it very well for storage and portability. Butternuts store very well so they are well worth growing in your garden if you like to put away food. We have some in our basement in a room that is not heated and they are in great shape after 6 months in storage! It’s time to empty the root cellar so here is a soup that makes good use of them as well as our stash of garlic. Prepare vegetables. Wash the butternut and bake whole in a 350 degree F oven for about 1 hour until easily pierced with a knife. Remove from oven, cut in half, and let cool while preparing other vegetables. For this recipe the leek tops are used to add flavor to the broth but they will later be removed because they are too fibrous. To prepare the leeks, cut off the roots of the leeks, and then cut off top two-thirds of the leaves. Wash them well but do not chop–set aside. Now wash the bottom third (the white part of the root) being sure to wash out any soil between the layers by cutting lengthwise and spreading out the layers under a stream of water in your sink. Now chop this bottom third of each leek. Melt ghee or coconut oil in soup pot. Add the chopped leeks (not the tops), chopped celery, cayenne, and cumin and simmer over medium heat to soften for about 5 minutes giving an occasional stir. Add the crushed garlic, stir well and then add 4 cups of water. Put the leek tops in the soup pot folding them up if necessary to submerge them in the liquid. Bring to a boil and immediately reduce heat to maintain a gentle simmer. Cover with the lid cracked. Simmer for 1 hour or until vegetables are very tender. While the vegetables simmer, scoop out the seeds from the butternut and discard. Scoop out the flesh (discard the skin) and place in a bowl. Set aside. Now remove the leek leaves from the soup pot with a fork avoiding removing the other vegetables (be careful as they are hot–place in a strainer so that the broth on them drips through the strainer back into the soup pot). They have done their job flavoring the broth and can now be discarded. Next, use an immersion blender and puree the mixture in the soup pot. Add the butternut squash and puree again until smooth. Add the coconut milk stirring well. Warm through on medium low heat. Add salt and pepper to taste. Serve hot. If you are not familiar with celeriac you have a new vegetable friend to look forward to meeting! I first had a celeriac soup years ago in a Waldorf School cafeteria and its extraordinary goodness never left my memory. I have tried to re-create it since and this recipe is as close as I’ve gotten so far. The one I had likely had dairy in it and this recipe is dairy-free. It does have potato in it but the amount is very small so I would still categorize this recipe as low carb. If you have access to good quality milk or cream (from organically fed and grass-fed cows) and tolerate it well, it would be a delicious addition to this soup. Set aside some time to prep all these vegetables–that’s the hardest part of making this soup. Give it your best shot and let me know how yours turns out! The only part of the leek that you add to the soup is the bottom third–the part that is mainly white. After cutting the bottom third off and cutting off the roots, slice into quarters lengthwise 3/4 of the way down so you can rinse all the soil out from between the rings of leaves. Once clean, chop fine. (The upper two-thirds of the leeks should be kept for broth; I used the leek tops–which I cut off the day before I made this soup when I was making the chicken broth.) Wash the celeriac well, peel with a vegetable peeler, and then chop into 1/2 inch cubes. Chop the onions and celery fine. Peel the potatoes and chop into 1/2 inch cubes. Melt the ghee over medium-low heat in a large soup pot. Add the onions and leeks. Stir and simmer over medium-low for a few minutes. Add the potatoes, celery, and celeriac. Stir well and continue to heat for a few more minutes. Now pour in enough water to just cover the vegetables. Bring to a boil and then immediately lower heat to medium low to keep the soup simmering. Cover the pot but keep the lid cracked. Simmer for a few hours until all vegetables are soft. Remove about 3 cups of the soup and place in a bowl. Puree the rest of the soup until creamy with an immersion blender. Add the chicken stock and the soup that was set aside in the bowl (which provides texture to the soup) and stir well. Heat a few more minutes until evenly heated through. Salt to taste. Add pepper as desired. Serve hot, garnished with chives.